let me warn you by saying some of the photos are a little graphic and not for the really weak stomach. (andy was able to look at them so most people should be fine other than the GROSS comment when you see them). on march 8th andy and I had plans to go to Kingsport to do some shopping and so that andy could get his hair cut. we decided at the last-minute to go to the farm and check on my babies. on the way to the farm we pass my grandmother’s house and as we did we saw a tractor with the bucket lifted all the way up and a man standing in the bucket with a chainsaw. there were several men on the ground holding a rope that was attached to a limb. I did a double take and told andy to pull in because it was my dad. (this is the don’t judge me part – because I really do feel bad I made these comments) I told him to pull in so that I could get a picture for life insurance policy proof. we chuckled and missed the drive way. we decided to go on to the farm but something inside me (and andy confirmed in him too) said to turn around and go back. we made a loop and went through a field and I made a second comment that I didn’t see him in the bucket and I hoped that he didn’t fall out. we pulled into the driveway and a guy came running over to us saying we needed to pull the car over to the group of people because someone broke something. I walked over and andy drove over and we found my dad leaning against the tractor holding his boot, with scratches on his neck. we loaded him up and went to the er. we got him checked in and made him pose for pictures with his arm band. (he still looks like trouble even waiting on the er). the good news is that he thought he broke his ankle. he didn’t. but the bad news is he crushed his heel. they splinted it and told him to get an appt when he got back home to see a surgeon. the next morning he noticed blisters. (gross I know). he went to the er when he got back home and they re-wrapped it and scolded my parents for unwrapping it to begin with. they got an appt with a surgeon that does ankles and heels and was told they needed to see someone who only does heels and ankles. they finally got in with the right doctor and he was not happy. he stated that this type of injury needs to be taken to surgery within 48 hours of it happening. and they were almost 3 weeks out. just gets better and better doesn’t it?! after much discussion they decided not to risk surgery since it was a little late to be doing it. the road to recovery will be long but it is what it is. 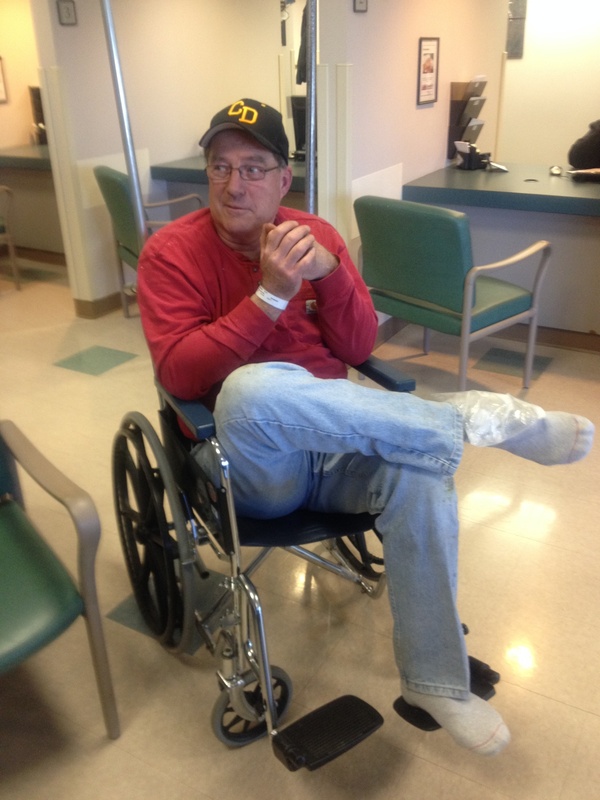 they had to cancel going to Bristol and going to fl but dad is doing good on his crutches and his scooter. he is adapting to being non weight baring for 2 entire months and maybe more. he is thankful that his new chainsaw didn’t get hurt when he had the forethought to toss it away from everyone when he was knocked out. we are thankful that he wasn’t hurt worse (and that we have some gross pictures to share). 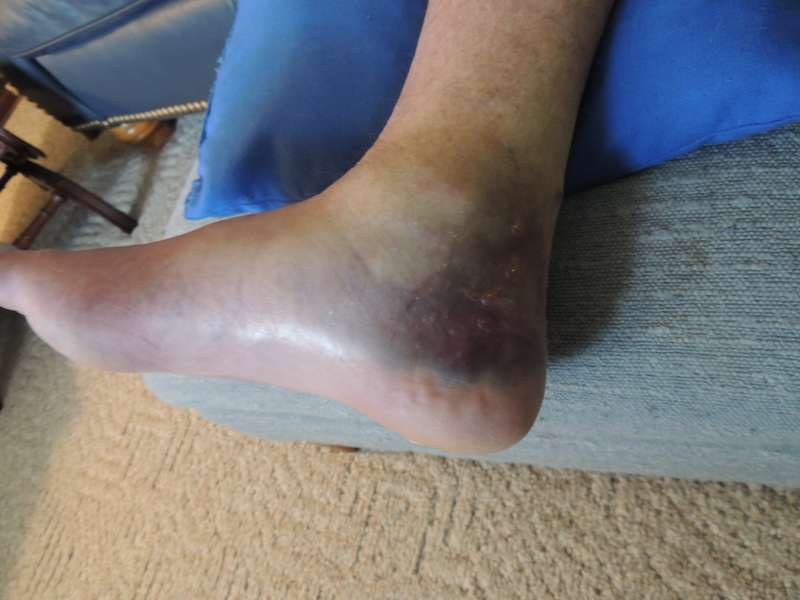 so when a farmer is in a tractor and gets knocked out by a limb…the important part to pass on to all of your family and friends is that a heel injury is not the same as a normal broken bone. 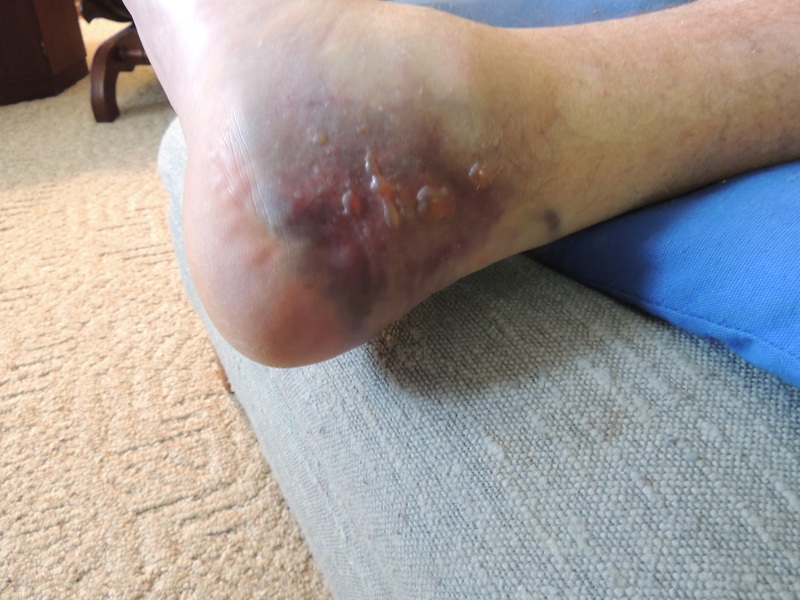 if you ever have one of those injuries as them to call in a consult for a heel specialist. don’t let them send you away with the standard answer of swelling has to go down for surgery!